Here is another great recipe that can really pass for breakfast, lunch or dinner. 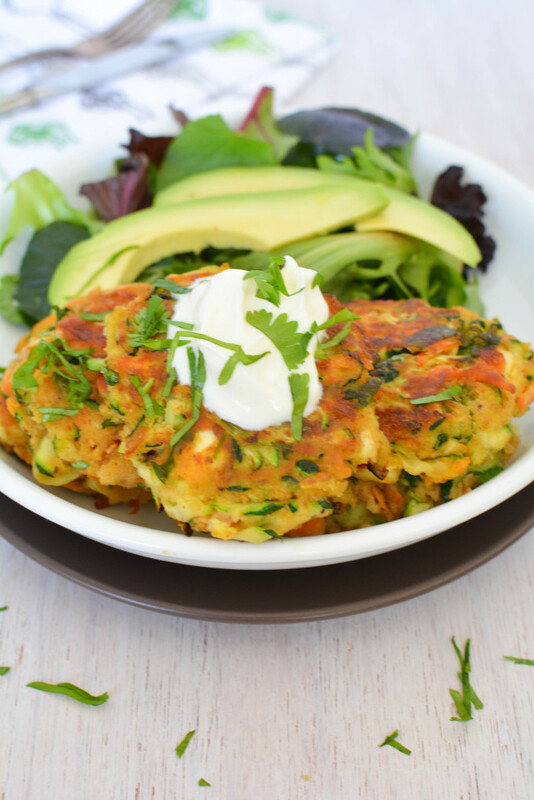 Dress it up these zucchini and carrot fritters with a salad for a hearty main meal, or on its own for a warm and delicious dinner. This little zucchini and carrot fritters will be gobbled up by the kids, and are great the next day in the lunch box. Whilst the zucchini is a great base vegetable for this fritter, you could easily switch the carrot to corn to suit your taste or for a little variety. In this recipe, I use flax meal to help bind the mixture and for its nutritional properties. I always encourage you to buy the flaxseed (often called linseeds) whole and grind them yourself in a coffee grinder or food processor. The reason for this is that the delicate oils can turn rancid with exposure to the air and light. When you buy flax meal already ground, you just never know how the seeds have been processed. You can grind a small batch of the flax meal and keep it in an airtight container in the fridge. Mix it up, add some spices and enjoy! Use coconut oil to cook the fritters. Either omit the natural yoghurt or replace it with vegan sour cream. Mix together all of the fritter ingredients. Heat some butter in a large frypan over medium heat. Add a heaped tablespoon of the batter into the frying pan. Cook for about 3 minutes on each side, or until the fritters begin to set on the bottom. Flip them over and continue to cook the fritters until they are set. Meanwhile, toss together the salad ingredients and drizzle with olive oil. Stack the cooked fritters on a plate and top with a dollop of natural yoghurt. Serve with a side of salad.